Indoor Air Quality Monitor @Raspberry_Pi #PiDay #RaspberryPi « Adafruit Industries – Makers, hackers, artists, designers and engineers! Volatile organic compounds (VOCs) are emitted as gases from certain solids or liquids. VOCs include a variety of chemicals, some of which may have short- and long-term adverse health effects. Concentrations of many VOCs are consistently higher indoors (up to ten times higher) than outdoors. VOCs are emitted by a wide array of products numbering in the thousands…. 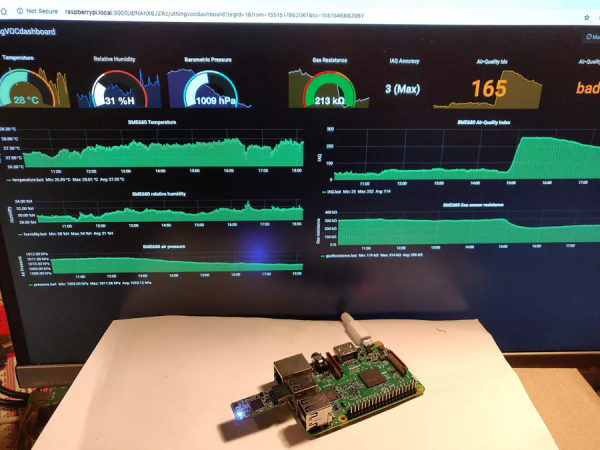 In this project, we will learn how to measure VOC levels using a USB sensor dongle connected to a Raspberry Pi, store the data into an InfluxDB time-series database and use the Grafana application to quickly build an air-quality monitoring dashboard.